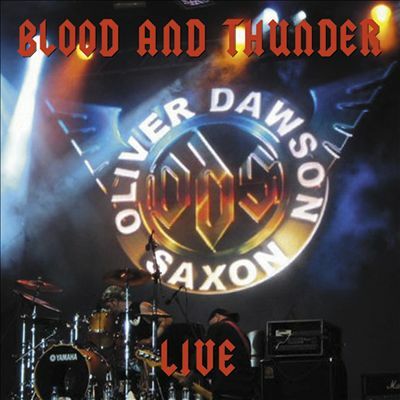 But back to “Blood and Thunder Live”. For the German audience they have come up with an intro “Schwermetal Fur Immer” and “Fetzen Fliegen V”, otherwise it´s almost entirely SAXON classics. The album is recorded in both Germany and Barnsley to be precise. The noteworthy exceptions are S.O.B. classic “Past the Point”, which has that classic Barnsley feel, and “Whippin´ Boy” off their latest album “Motorbiker”, which has more of a feeling of their previous vocalist John “Wardi” Ward but still boosts a fat riff. I have a faint notion that OLIVER DAWSON SAXON´s homage to the band´s halcyon years has caused the sudden retro track lists of Biff and co. You can tell that Graham, who has always been the musician of the lot, is in shape, Hayden, is affine sidekick who is more than capable on his own, so the guitar front is particularly kicking. Bass-wise there is Dobby, the legend, who never misses a beat and knows how to work the crowd. Paul, being by some distance the youngest member, and without the pedigree of the others, does a fine job keeping the fat 80´s drum sound alive, especially with “Crusader”. The oddest part is SEVENTH SON vocalist Brian Shaunessy. He must have been in the business for long but his way of chatting with the audience feels pushed and strained. His voice is in remarkable shape though and scarily close to that of Mr. Peter Byford. Perhaps he needs more gigs, which he will get as OLIVER DAWSON SAXON are eager to keep their heritage alive on stage where they belong! This is not a polished perfect product like the heavily studio doctored “World Wide Live” by THE SCORPIONS. Some will not like that, but I personally admire those that truly come alive in this digital day and age. If you like the SAXON of old I really recommend this one.